The genius of The Beatles often lay in their ability to synthesize sounds, musical ideas, snippets by great predecessors and coursing cultural sensibilities from multiple sources: Rock-A-Billy, Blues, symphonic music, English music hall ditties, pure pop, Folk and Raga. They wove a phenomenal career from it all. When they were at the ultimate top of their game, however, they turned savagely avant-garde and more than simply broke down walls of considerable height and thickness. They pulverized the walls and produced work that is startlingly advanced even a half century later. One such song is "I Am The Walrus." It is clearly a John Lennon composition although each of the three other Beatles all had a hand in it, as did producer-arranger and "fifth Beatle," George Martin. In the five decades since "I Am The Walrus," no single performer or group has come close to erecting such a cathedral to such weird yet embraceable music. Interestingly, the song was glossed over by critics. Esquire's resident musical critic-crank at the time, Robert Christgau (later of the ever-in-high-dudgeon Village Voice) does not mention "I Am The Walrus" by name in one of his bitchy columns for the men's magazine. Britain's New Music Express begs us to live with the song for a while so we might enjoy it. The zinger that underlies the epic, critical fail is that John Lennon (right) was goofing on the critics, professional and amateur. In a fine ironic twist, the casual fan – a lot of them still teenagers who had grown up on hearty Beatles fare – got Lennon's inside silliness, while the grown-ups reviewing and picking nits were left with semolina pilchard on their faces. "Walrus" is a funny song, a good goof, a whirling critique of society, ha-ha-ha, he-he-he, ha-ha-ha...Lennon's penchant for absurdist lyrics is legendary. "Norwegian Wood"; many entries from the Sgt. Pepper's album; "Happiness Is A Warm Gun," and "Come Together" are a few citations where the beginner can begin to find his or her way through the Lennon thicket. The listener is essentially being told from the beginning that we are all The Walrus, a character from Lewis Carroll's poem found in Through The Looking-Glass. Its story line and two main characters have been variously interpreted as a confrontation between Capital and Labor; a dialogue between Buddha and Christ; a sort of sideswipe of Hinduism – The Walrus serving as stand-in for the tusked elephant of Indian mythology; or just a nonsense rhyme for kids, an interpretation that Carroll himself seemed to favor. Carroll said that his works were not meant for the analysis of "mad people." The same observation easily applies to the lyrics of "I Am The Walrus." Of course, there are evocations upon evocations, flashing images that make a Pointillist painting best viewed from a distance rather than a neat Kodachrome snapshot with sharp details that come into focus. It might be noted that Carroll's character Alice also shows up in The Jefferson Airplane's "White Rabbit," another song that is about thoroughly kneaded, well-stretched, highly leavened reality. Finally, "The Walrus And The Carpenter" is delivered by Tweddledum and Tweedledee, known for their contradictory double talking. The music is murky, reflective and supportive of the oddball lyrics. Ringo's languid drumming steadies the innovative bending of the strings and horns. Paul McCartney provides a somber, driving bass and Lennon pounds the piano like a player in a silent movie theater backing a grainy horror film. Surprise moments of feedback, screechy and unnerving, are intermixed with mumbling and at one point with a sampled radio performance of King Lear. Aside from the famed title line, "I am the walrus," the song has given us nuggets like "I am the eggman," and "Goo-goo-ga-joob, goo-goo-ga-joob." The last of those lines shows up again in Simon & Garfunkel's "Mrs. Robinson," when they sing, "Koo-koo-ka-choo, Mrs. Robinson, Jesus loves you more than you will know." Talking to a raisin who occasionally plays L.A. 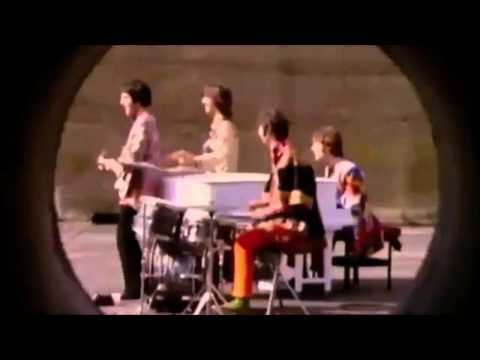 Memorably, "I Am The Walrus" closes with a gibberish vocal jam in which assorted voices sing, amidst hosannahs of "Goo-goo-ga-joob's," "Everybody's smoking pot" interspersed with "Everybody's fucked up." So much of "I Am The Walrus" is guttural, primal and without concrete meaning, seeming like something swirling in the void, you have to wonder if the song isn't some sort of therapy, an emptying of Lennon's - and The Beatles' - attic. Other memorable lines have made their place into cultural history. The Poe reference is particularly fitting. Poe's earliest biographer, Rufus Griswold, maliciously started the false rumor that Poe was a no-good, womanizing drunk, which not only failed to tarnish Poe's status but succeeded in burnishing it. Lennon, as is widely known, was no stranger to controversy. His infamous quip, "[The Beatles] are more popular than Jesus" is enough to cement that kind of reputation and link him with Poe, a writer who served as a model for all artists in any genre who have followed. Lennon, too, enjoyed even wider popularity after critics lashed out at him. Lennon's singing comes off as a tad whiny but his ability to modulate – honking, so to speak – makes it an effective tool in his old kit bag. The mad, mad backing vocals were laid in by The Mike Sammes Singers, a local London vocal group of the day. Perhaps the most off-key facet of the tune is that George Harrison does not play guitar on it, neither rhythm nor lead electric. As it is, the song is otherworldly, without argument, but a lead guitar on the level of "While My Guitar Gently Weeps" would have established it as one of the top 50 songs of all time. The allusions to Humpty Dumpty are clear – the Eggman – and in some versions, Humpty says something like “Goo-Goo-Ga-Joob, a sort of mimetic device for an egg come to life and then crunched after falling off a wall. Some analysts with, perhaps, too sharp a pen, liken the Goo-Goo-Ga-Joobing to lines written in James Joyce’s Finnegan’s Wake. Finnegan does indeed fall from a ladder and utters some crazy gibbering. And the entire novel is filled with cryptic word-play that has ceaselessly fascinated critics, professors and lit students.